Fresh snowflakes come to rest on pavement in Gatlinburg, Tenn. The motel clerk said it hadn't snowed in two years in the town at the cusp of the Smokies. Granted, there wasn't much on the ground, but it was more than these Tennesseans are accustomed to. This building caught my eye while I was driving along U.S. 441 in Pigeon Forge. Not sure why. The continental breakfast is my favorite part of staying in cheap motels. No matter how sleazy they may be, such establishments often still offer cheesy danishes, sugary cereals and buttery toast in the morning. But when I woke up after a restless night at the Super 8 in Gatlinburg, Tenn., there was only one thing I wanted for breakfast: coffee. I had been awake for more than 36 hours - time mostly spent in a driver's seat - before finally falling asleep the night before. The hangover from driving all day hit with full force. A light snow fell as I walked, arms hugging myself for warmth, to the motel office. But there was no coffee. Not even a danish. I was the only guest overnight, and the staff - a lone person - didn't bother to make a pot just for me. She offered to start one, but I wanted to hit the road. After consuming Froot Loops from a Styrofoam bowl, I brushed the snow off my car with a golf towel - my clubs are stored permanently in my trunk - and headed north. U.S. 441, the route that made for hairy moments over the Great Smoky Mountains at sunset Saturday, was closed Sunday morning because of impassable conditions. 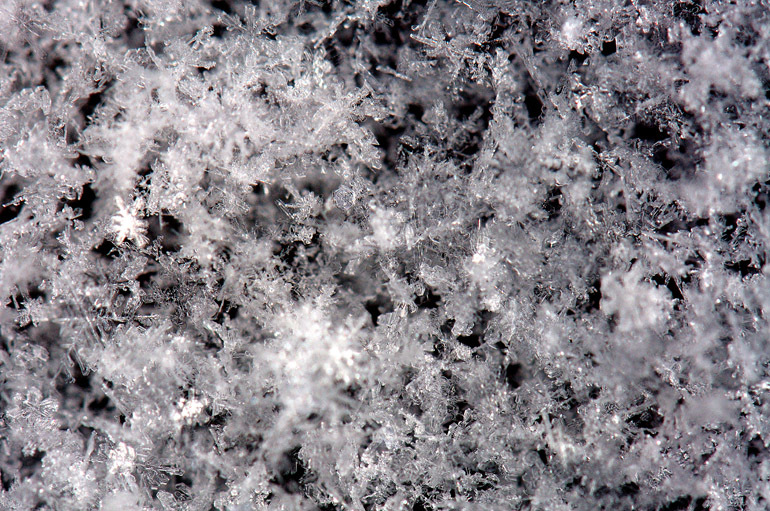 That foiled my plan to head back into the mountains to take photos of fresh snow sparkling in sunlight. But 441 away from mountains provided smooth sailing through more touristy portions of east Tennessee. From Gatlinburg, the next town over is Pigeon Forge, which bills itself as a "family vacation hub" and is the home of Dollywood, a park whose theme is, of course, Ms. Parton herself. Just as Gatlinburg showed shades of a hillbilly Orlando with its kitsch, Pigeon Forge emitted a rather South Florida vibe, with the 441 corridor lined by strip mall-style retail stores - but with a distinct mountain-bumpkin flair. There seemed to be an inordinate number of places pushing leather boots or hats, and I saw a few more Confederate flags than American ones. Some of it was a bit too "wild west," though, something that's not quite as indigenous to the region. These are merely passing impressions that I'm picking from my brain as I type. None of the touristy stuff moved me to stop for an extended time. Only once did I pull over to take a photo of an upside-down building in Pigeon Forge, just because most upside-down buildings I've seen have been on television and came about from some sort of flood or mudslide or circular wind. I was shooting for Interstate 81, which would put me on the fast track to Virginia and West Virginia, where there'd surely be more snow. Ignoring a flashing state DOT sign that said "Your GPS is lying" and suggesting I take an alternate route, I, nevertheless, found the northbound interstate. I drove past low mountains covered in more boring bare trees. I drove past hilly pastures and silos. Most scenes were nondescript and forgettable. The only excitement was when the Toyota Tundra in front of me blew a tire, spewing shards of black - and for some reason, green - rubber into my windshield. At one point, I left the highway to drive on some farm roads and to see what I could see. The views were the same as they had been for much of the trip: not spectacular. The town was Glade Spring, Va., just north of where Tennessee, North Carolina and Virginia all meet. 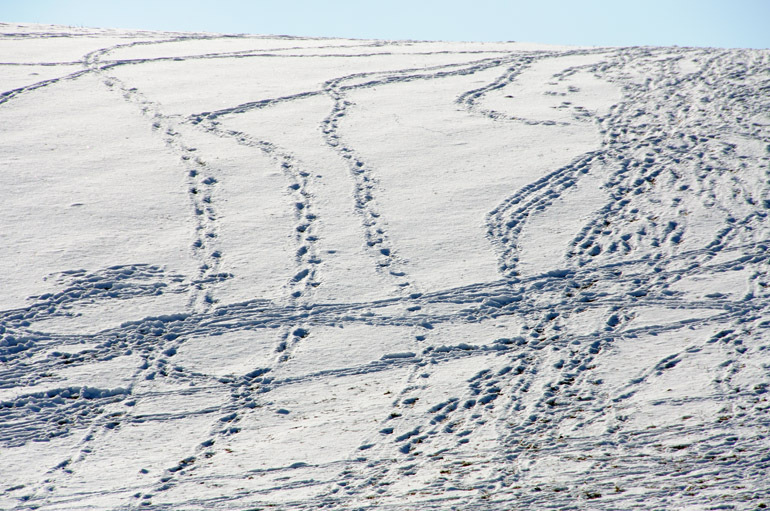 The terrain consisted of rolling hills, on which cattle roamed in search of tufts of grass sticking through a thin layer of snow. I toured the area while the Patriots' first and last playoff game sounded on AM radio. Each time I accelerated, though, the engine noise was picked up by the radio receiver and amplified by the speakers, hindering my listening. I tried to limit the number of times I hit the gas pedal, but that made for slow going. But the way New England was playing eventually moved me to switch off the game for good. Back to the highway. 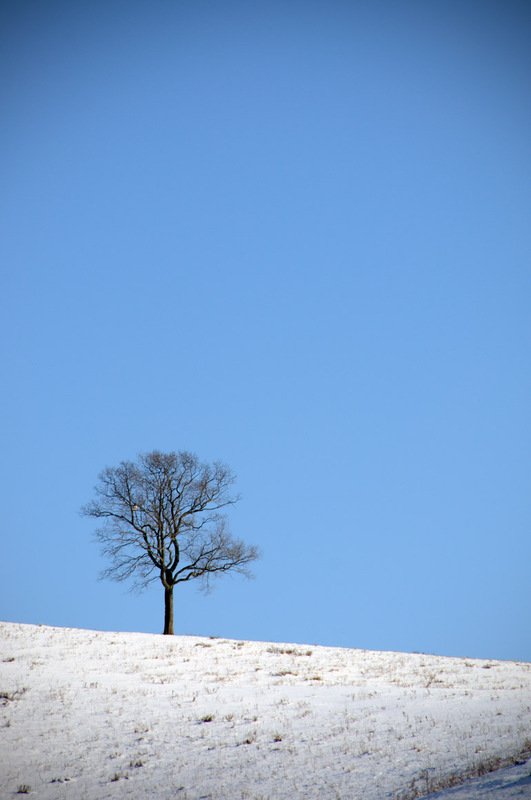 When I took a photo of a hill in a pasture in Glade Spring, Va., I didn't notice the hawk sitting in the lone tree. 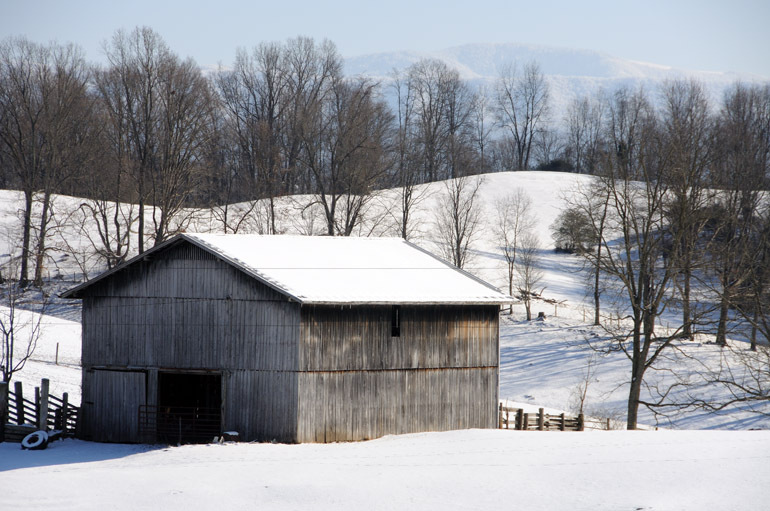 I traveled down a dead-end farm road paralleling the interstate and saw this barn, with the Blue Ridge Mountains in the background. Cattle tracks cover a hillside in Glade Spring. Interstate 77 winds and undulates through the Jefferson National Forest in the Blue Ridge Mountains of eastern Virginia. At parts, the highway didn't bother to undulate and simply went straight through the mountains. When I exited the north end of the East River Mountain Tunnel, I entered West Virginia, the only state wholly consumed by Appalachia, according to the Census Bureau. The uneventful day was coming to a close, so I stopped and looked for one more place that might be photogenic. My hometown is Princeton, Maine, so I was obligated to stop in West Virginia's Princeton just north of the Virginia border. There, at a tourist information station, a brochure said the newly reconstructed East River Mountain Overlook was a good place to view Bluefield, W.V., the state's most elevated city at 2,655 feet. The overlook, 3,500 feet above sea level, featured some dilapidated buildings that needed tearing down. Snow drifts blanketed the actual viewing platform. With no other tourists, it was desolate. And I imagined that the scene below would have been pretty if the trees were covered in leaves or snow. The chilly air, combined with a stiff wind, must have made it feel like 0 degrees in Bluefield. After just two days in that climate, my skin had become a dermatological desert. Constantly exposing my hands to the air while shooting photos turned them to leather. I badly wanted off that mountain, so I skidded down the slushy road and found another cheap hotel 90 miles away in Lewisburg, to which I traveled under the veil of night. When I pushed that card key into the door and opened it, I found that the heat was not turned on. Just my luck. 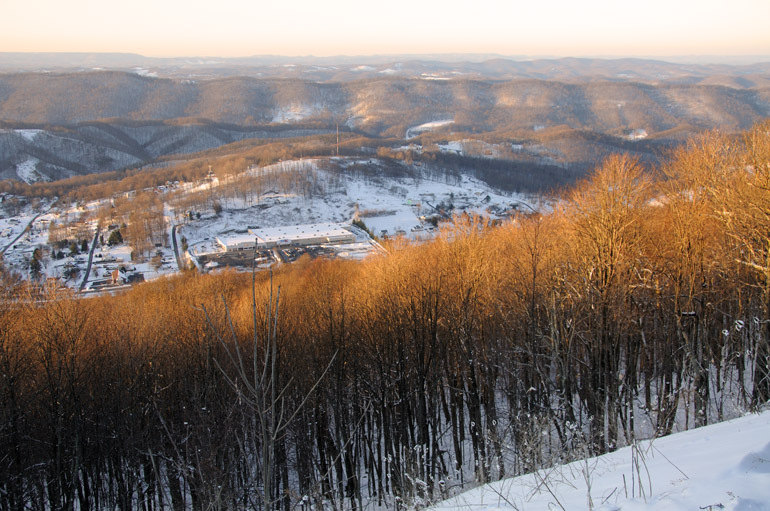 From 3,500 feet on East River Mountain, late-day sunshine brushes the tops of bare trees in Bluefield, W.V., near the border with Bluefield, Va. 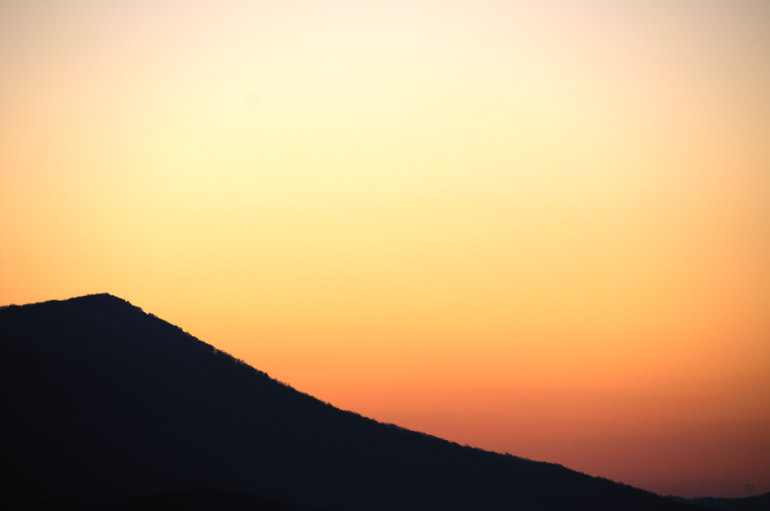 The sun sets behind East River Mountain. 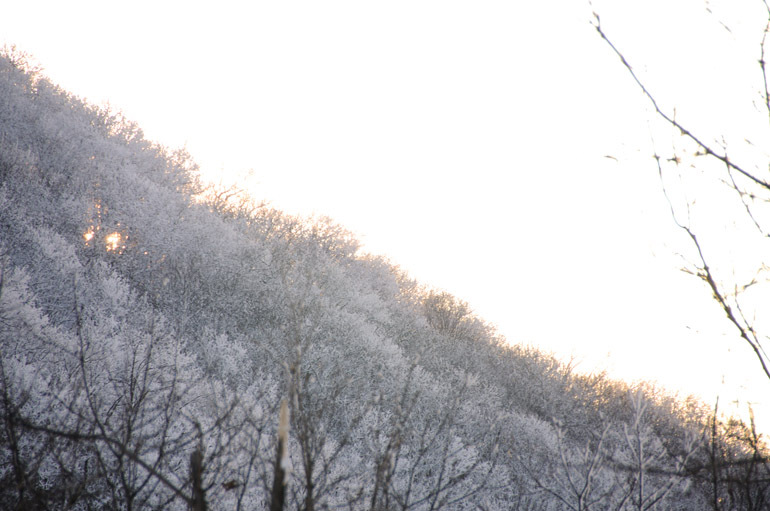 The treetops on most of the mountains throughout the areas of Appalachia that I visited were covered in snow. The lower regions, such as Bluefield at more than 2,600 feet, though high, had only a few inches of powdery white stuff on the ground. The sky glows behind a West Virginia mountain just after sunset on the Sunday of my extended weekend. 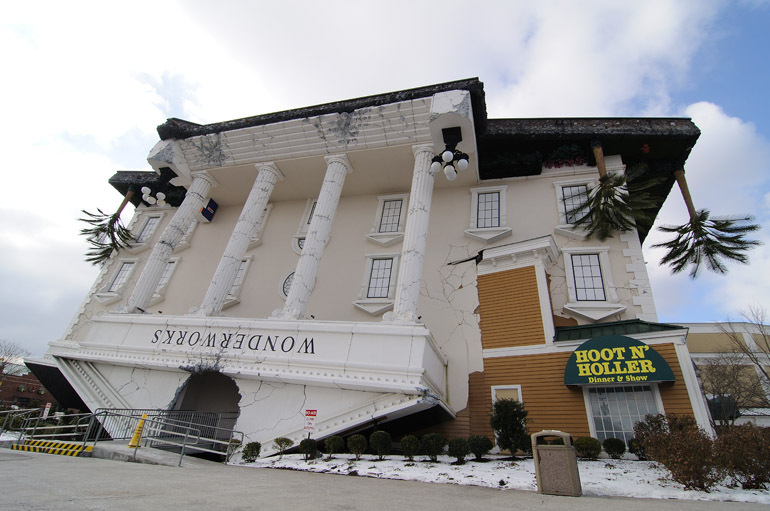 There's actually a WonderWorks with the same upside down building in Orlando. It's a science museum type thing.